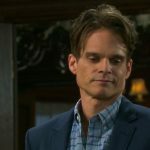 “Days of Our Lives” spoilers for the week of March 25-29 tease that we’ll see some showdowns and steaminess. First, let’s talk about Brady Black’s (Eric Martsolf) rage over Stefan DiMera (Brandon Barash). He can tell that Stefan is growing closer to Chloe Lane (Nadia Bjorlin), so he’ll try to do something about it. Unfortunately, Brady will just manage to make a mess of things. After Brady witnesses Chloe and Stefan’s growing connection, he’ll confront his former flame. Brady will think Chloe’s letting Stefan pull the wool over her eyes. He’ll urge her to see the light and move out with the kids. Chloe will insist on staying put, so Brady will do something a bit desperate. As their confrontation heats up, Brady will bring the heat in a different way by stealing a kiss. Naturally, “Days” spoilers say Stefan will walk in at that exact moment. He’ll see Brady and Chloe’s lip lock, so expect him to call Chloe out on it later. Stefan will rant about Chloe kissing her ex-husband, but she may not think he’s entitled to object. They’re just getting to know each other, so it’s not like Chloe’s in an intense committed relationship. Of course, two can play at that game! “Days of Our Lives” spoilers state that Stefan will eventually kiss Gabi Hernandez (Camila Banus), so there’ll definitely be some fun shakeups this week. In the meantime, Ciara Brady (Victoria Konefal) will have a little treat for Ben Weston (Robert Scott Wilson). Ben will have to be hospitalized, but it won’t be so bad thanks to Ciara’s sponge bath. “Days of Our Lives” spoilers say Ben will be shirtless and stuck in bed, but Ciara will make it enjoyable. She’ll waltz over with a water bucket and give Ben some special treatment. Both Ben and Ciara will seem pretty turned on by the experience. You can bet “Cin” fans are going to love these hot DOOL scenes. It looks like the excitement’s about to rev up in Salem. We’ll give you updates as other “Days” news and rumors emerge. Stick with DOOL and don’t forget to check Soap Opera Spy often for the latest “Days of Our Lives” spoilers, rumors, updates, and news.